Valiant was Plymouth’s compact car entry and was remodeled in 1963 to be less radical looking. It appeared slim and trim with a slightly longer hood than trunk. The fake spare tire on the trunk lid from earlier models was abandoned. 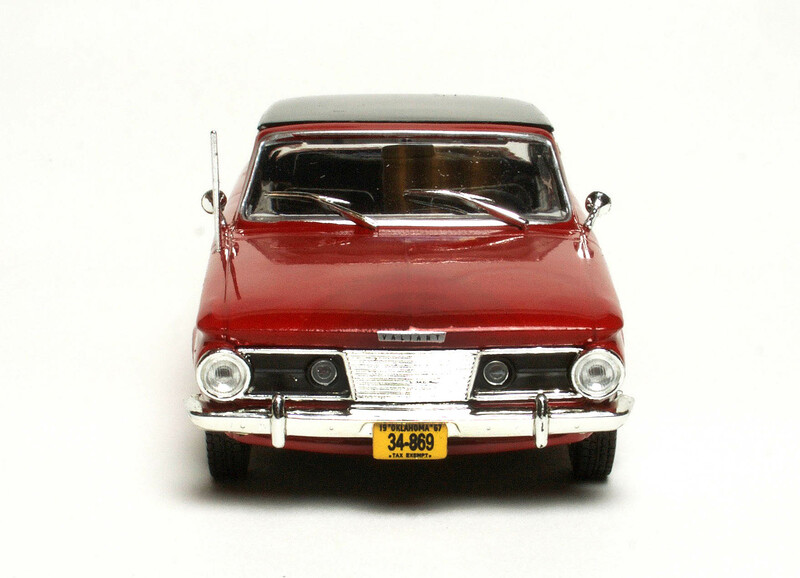 But in the 1960s car makers didn’t leave any model totally untouched from model year to model year. So by 1964 the trim horizontal taillights had gone vertical and stayed that way for several years. The grille was a sort of an inverted trapezoid and a styling theme used in other Chrysler products of that era. Horizontal bars were added later. Valiant came as a 2-door coupe or hardtop, plus a 4-door sedan and station wagon, and a 2-door convertible. 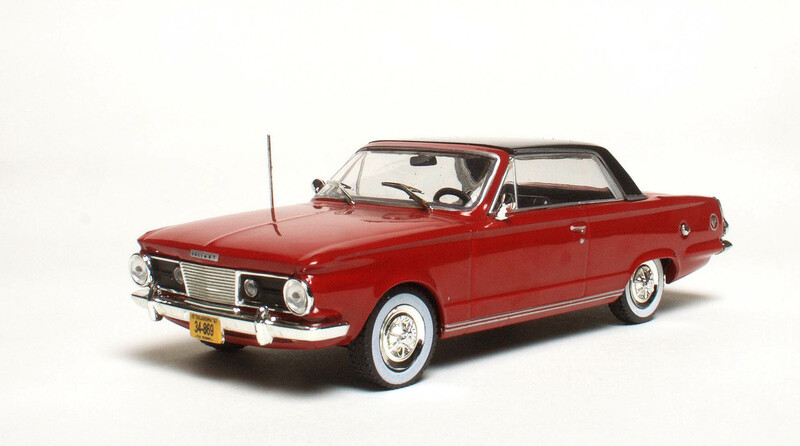 The review model is a 2-door coupe. Three engines were available. Two were the venerable slant-6 models, a 2.8-liter (170cid) and 3.7-liter (225cid). Plus the small car featured a gutsier 4.5-liter (273cid) V8 that created 180 horsepower. The Acapulco only offered the 225 and also came with bucket seats and a passenger’s side mirror, which the review model has. 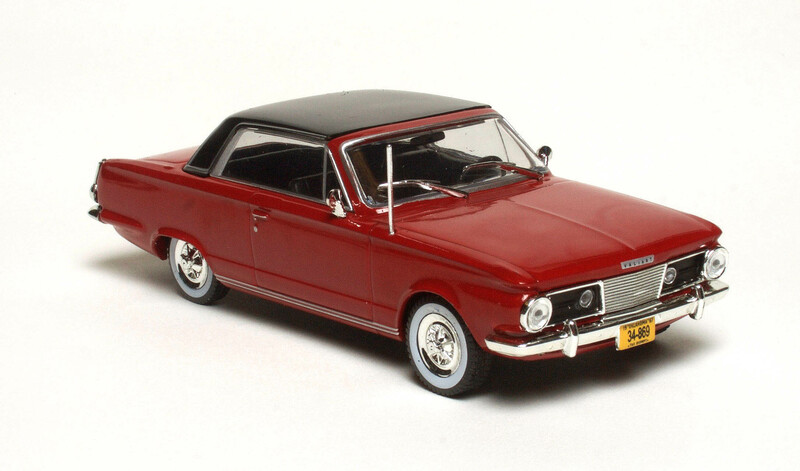 Vinyl roofs also became an option in 1962, and that is featured here too, in black. 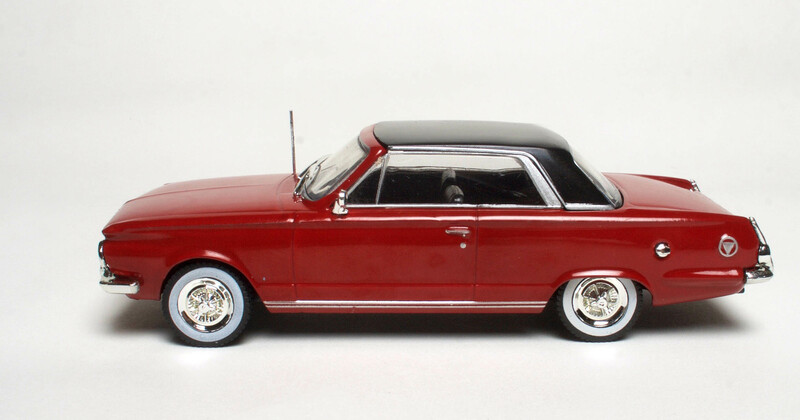 WhiteBox is a value-oriented die-cast brand that creates a wide variety of models and this 1/43 scale Valiant is nicely executed for its $29.95 price. At that price you can fill gaps in your collection without damaging your hobby budget too. This is a glossy bright red with flat black roof and plenty of chrome trim on the windows, including side vent windows. The grille with its horizontal bars is chrome with a blacked out area on either side that houses small running lights. The headlight lenses are clear and the bumper chrome. In back, the bumper is chrome and the taillights are chrome painted red. There’s also a chrome gas cap on the driver’s side rear quarter panel along with a vague circular logo that also appears on the trunk. A Valiant logo appears on a silver badge on the car’s nose too. The Valiant has two chrome mirrors and an antenna on the passenger’s side front fender along with good-looking chrome wipers. The car rides on wide white-sidewall tires and feature large chrome wheel covers. There also are windows all around the car that limit your view of the interior, but it’s black and includes bucket seats, door trim and a 3-spoke steering wheel with some gauges visible behind it. *Car is mislabeled as 1965, but is a 1967.